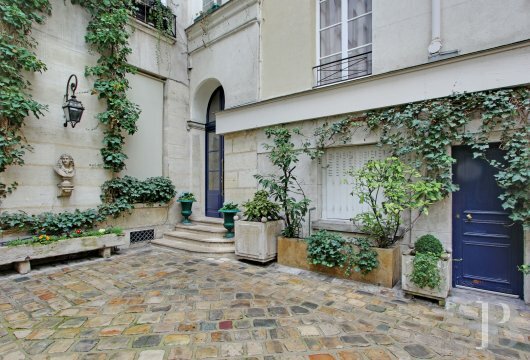 An elegant, 132 m² flat, overlooking paved courtyard and street, in a late 17th century building near the Palais-Royal Gardens - appartments-for-sale - in Paris left bank and right bank - Patrice Besse Castles and Mansions of France is a Paris based real-estate agency specialised in the sale of Appartments, mansion houses, lofts-terrasses, houses. 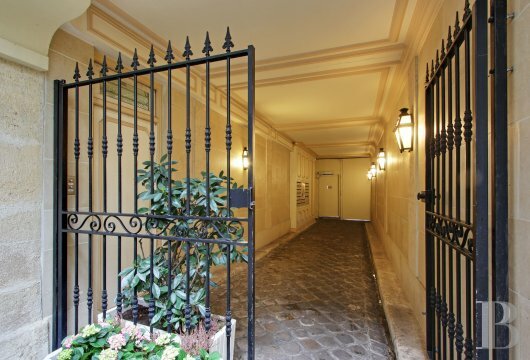 This flat is in a quiet street between Rue-de-Richelieu and Avenue-de-l’Opéra, near Molière’s Fountain. A historic district, it is dotted with 17th & 18th century buildings and abounds in a variety of shops. Weekly markets are held in Place-du-Marché-St-Honoré and Place-de-la-Bourse. 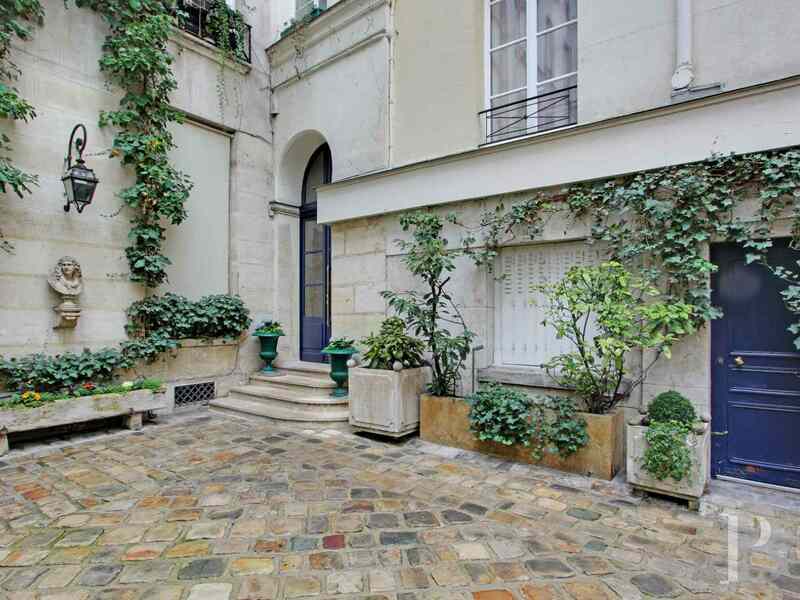 Just a stone’s throw away, the Palais-Royal, with its gardens, and the Comédie-Française theatre are among some of Paris’ main attractions. 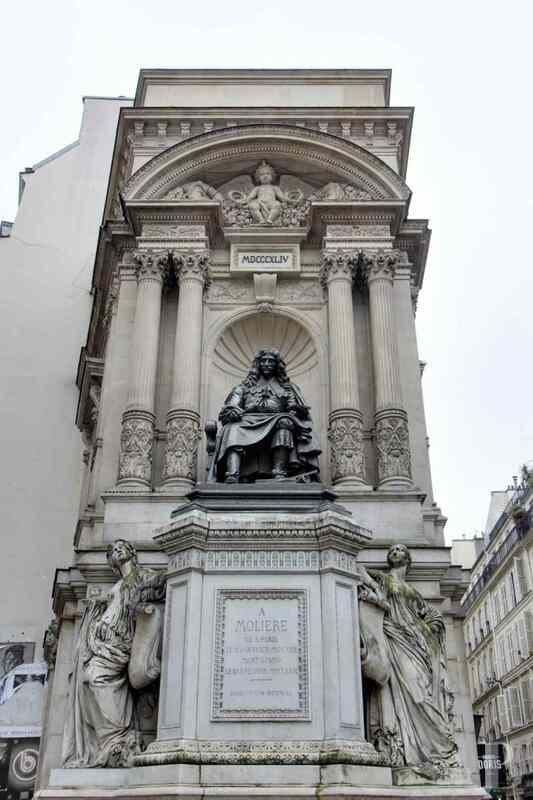 Pyramides and Palais-Royal underground stations are nearby as are several bus routes. 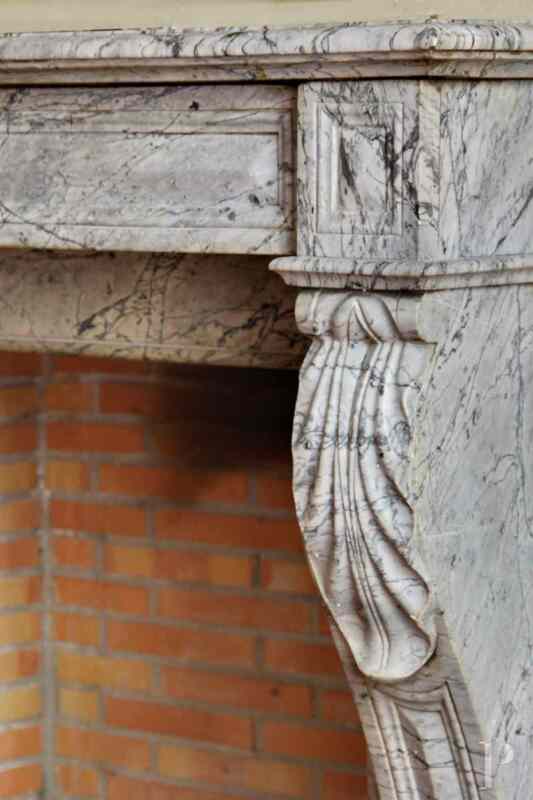 The building dates from the late 17th century, its elegance making it typical of this period, despite its plain lines. 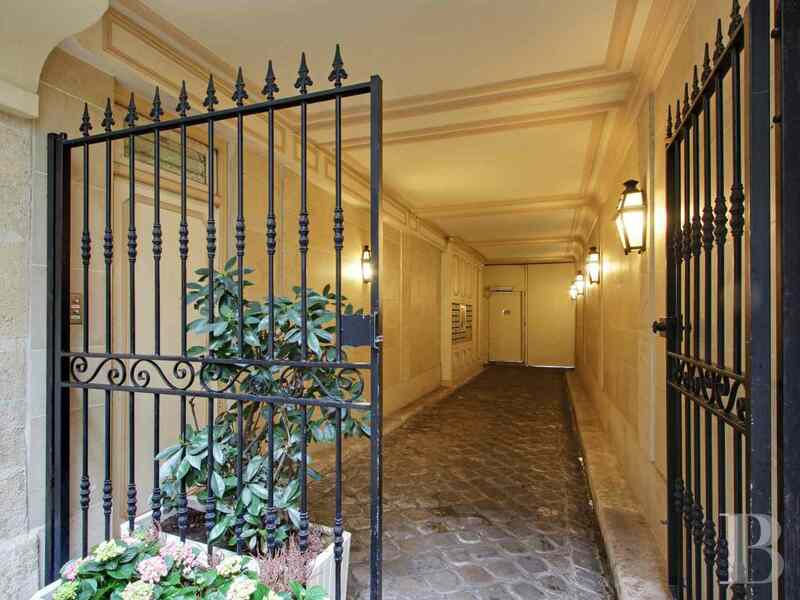 Majestic, semi-circular arched carriage gates, with their keystone and wrought wooden panels, open into an entrance passageway, decorated with pilasters and ceiling moulding, which leads to a paved courtyard. This first floor, through flat is reached via a lift. Facing north-west and south-east, it overlooks the street and a planted courtyard. 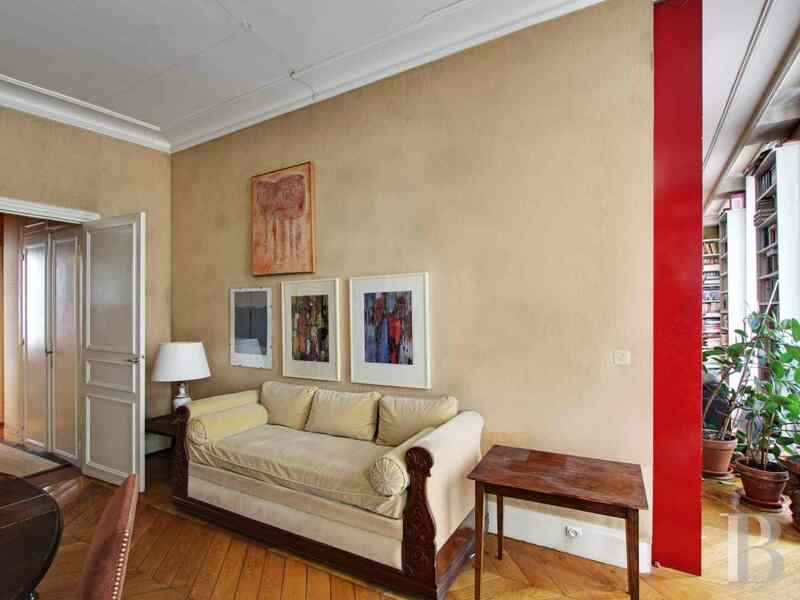 Spanning a floor surface area of 132 m², with 3 m high ceilings, its front door opens into a gallery featuring herringbone parquet flooring, which leads to a toilet, a spacious cupboard with hanging space and then to a 14 m² kitchen where it is possible to take meals, overlooking the paved courtyard. 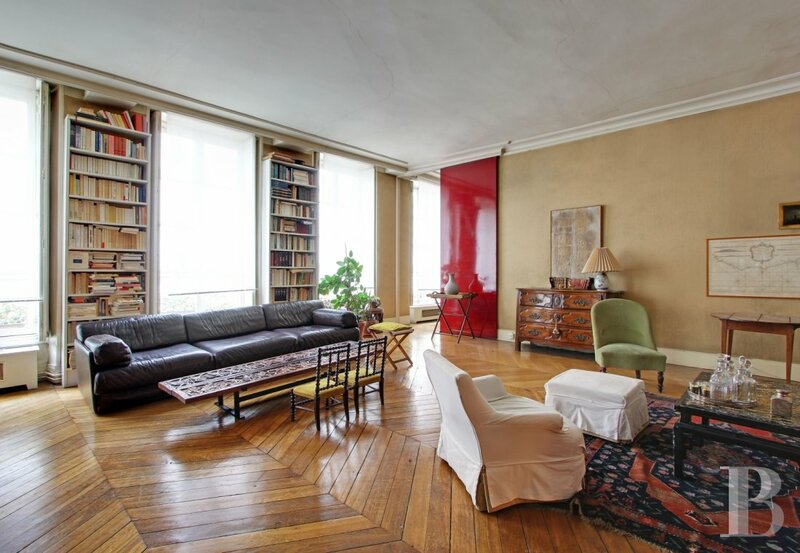 Double, moulded doors open into a vast, 47 m² living room, with herringbone pattern parquet flooring and ceiling moulding. It is illuminated via three tall windows with wooden slatted shutters. 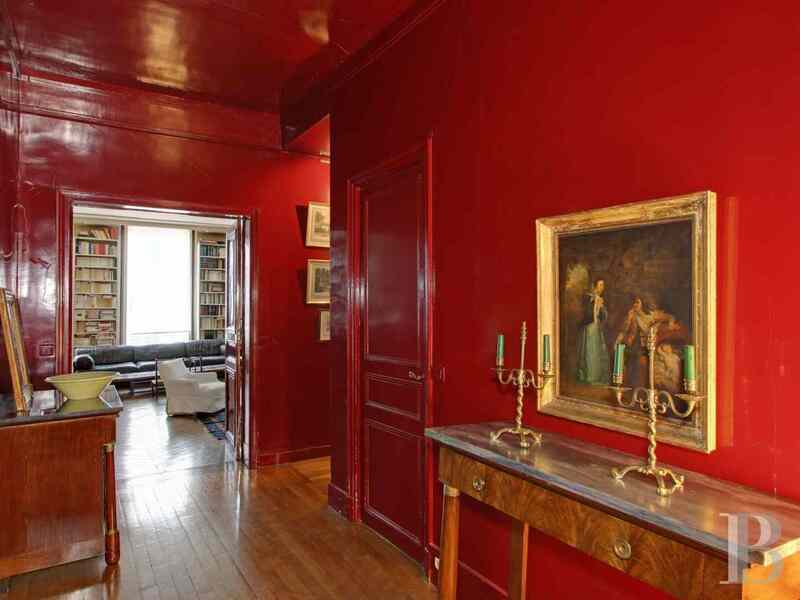 It is followed by a 22 m² dining room, separated from an 18 m² bedroom via a small lobby and a bathroom. 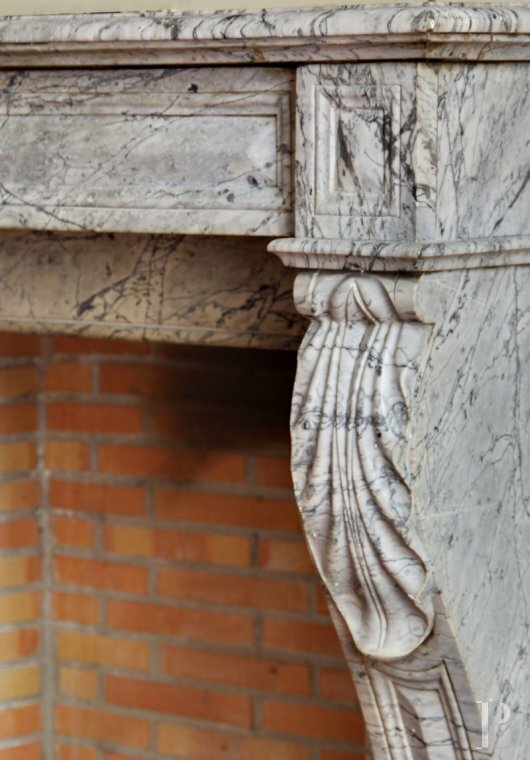 Despite exuding style, this flat is still in need of restoration works. 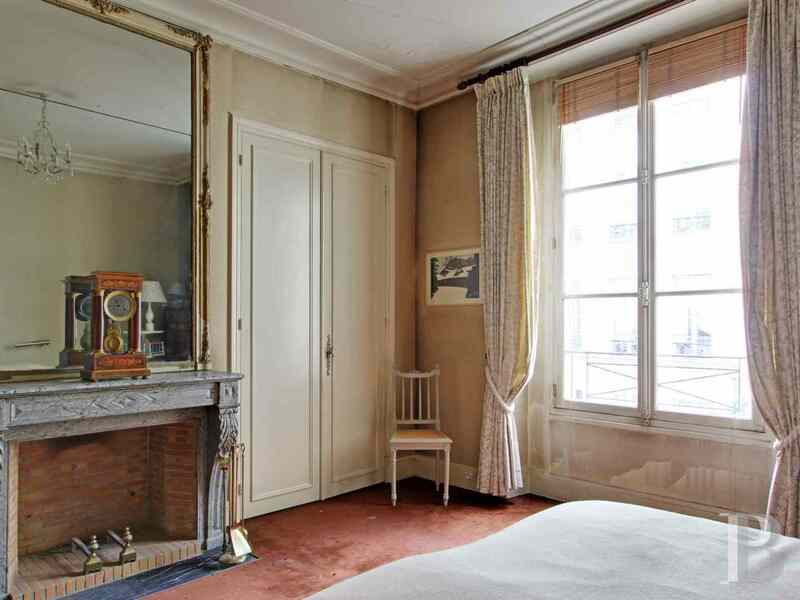 It stands out courtesy of its spacious rooms, illuminated via tall picture windows. 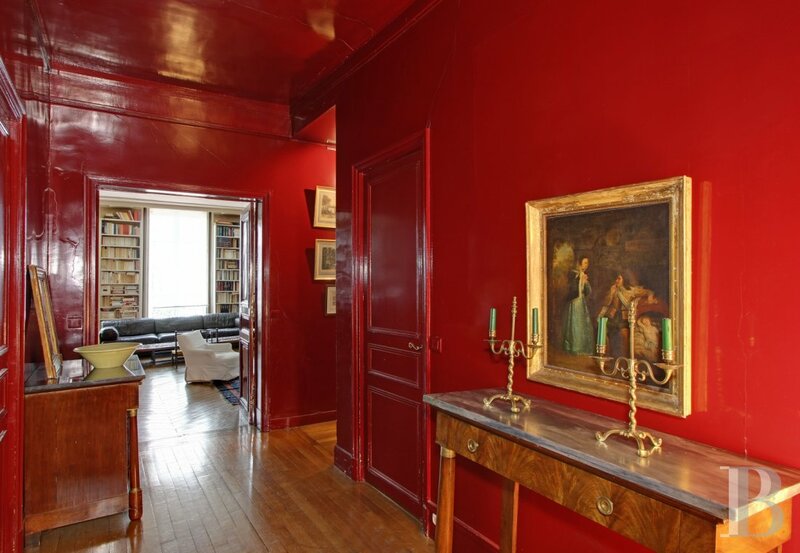 The gallery walls are painted a glossy Bordeaux colour. 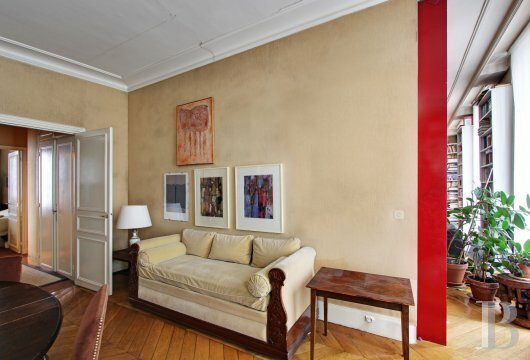 On the road side, the spacious living room and the dining room, which could be used as a second bedroom, respectively span floor surface areas of 47 and 22 m² under 3 m high ceilings. The window embrasures house moulded wooden shutters, composed of several panels. 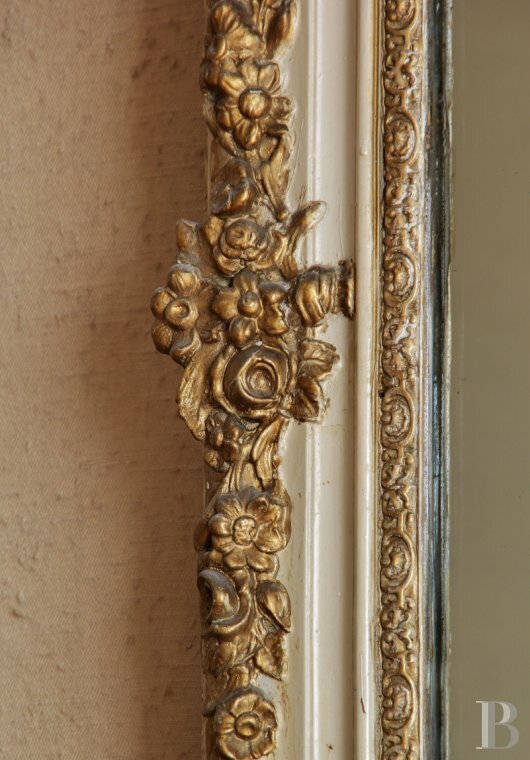 A fireplace, taking pride of place in the lounge, is topped with a large mirror, with a gilt, wooden frame. 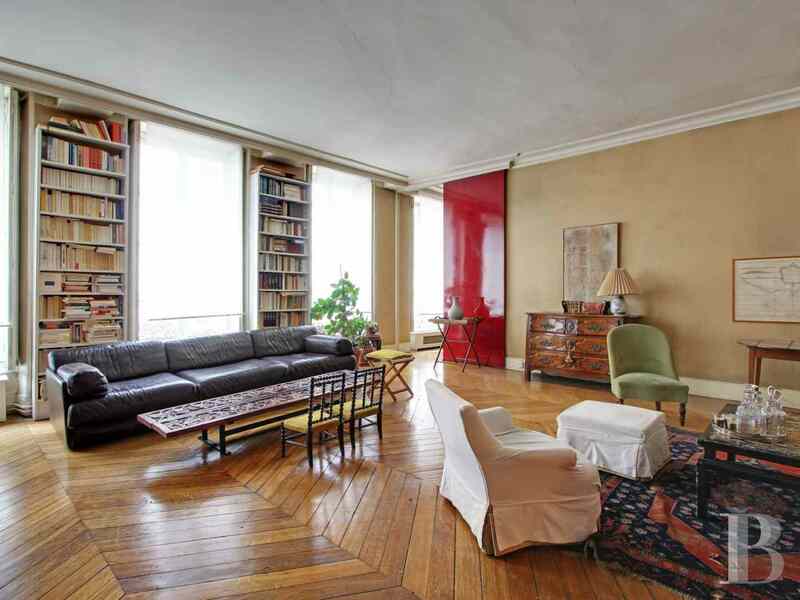 It reflects the herringbone pattern parquet flooring. A hanging space and numerous cupboards are extremely useful. 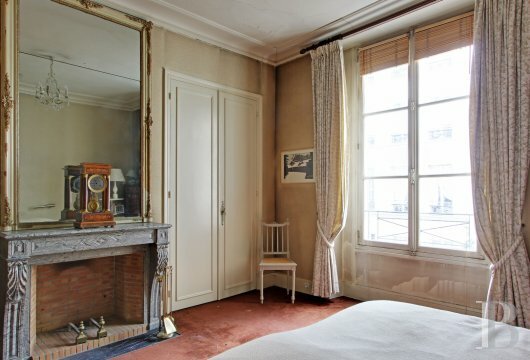 A spacious, 18 m² bedroom, featuring a fireplace topped with a mirror, overlooks the courtyard, benefitting from peace and quiet as well as the decor of this inner courtyard where bamboo, ivy garlands and rhododendrons are mixed in planters, that contain blooms as of the spring. The 14 m² kitchen, where it is possible to take meals, has a window providing a view of a bust of Molière in the courtyard, bringing the nearby fountain to mind. 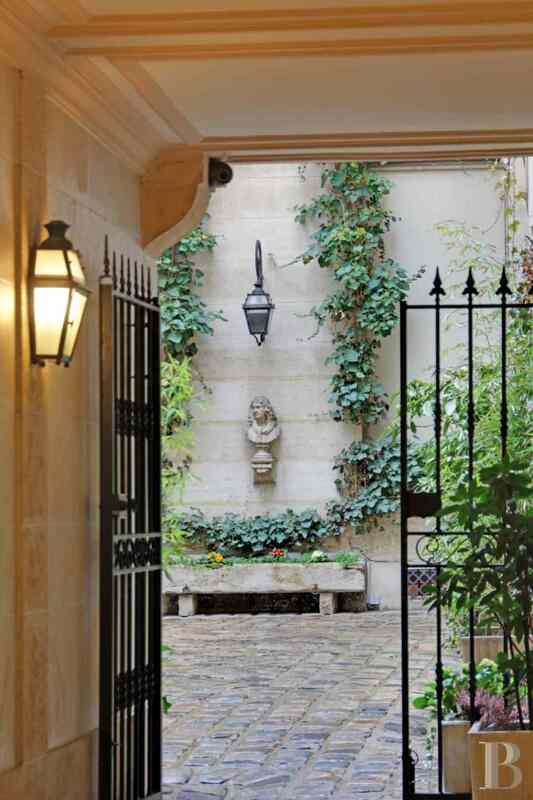 A lantern above said bust illuminates the sandstone paving at night. This flat is equally well suited to receiving guests as accommodating a family and even an office for professionals wishing to work from home. 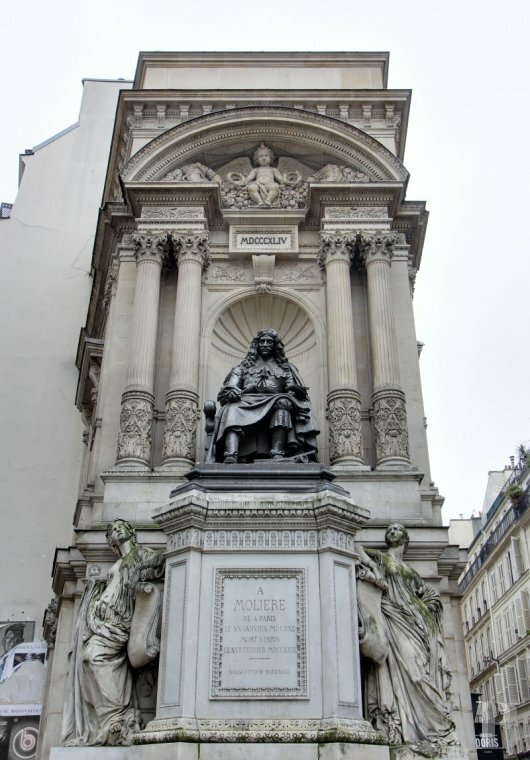 The district is historically an enjoyable one with the pleasures of the mind currently carrying the day courtesy of the Comédie-Française theatre just a stone’s throw away. 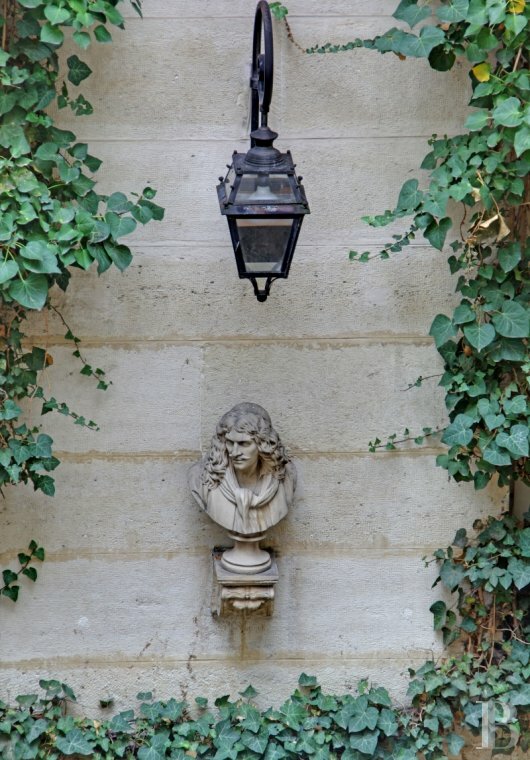 A bust of Molière, in a superb paved courtyard, is a reminder of the solemn fountain, dedicated to the great playwright, on the corner of the street. 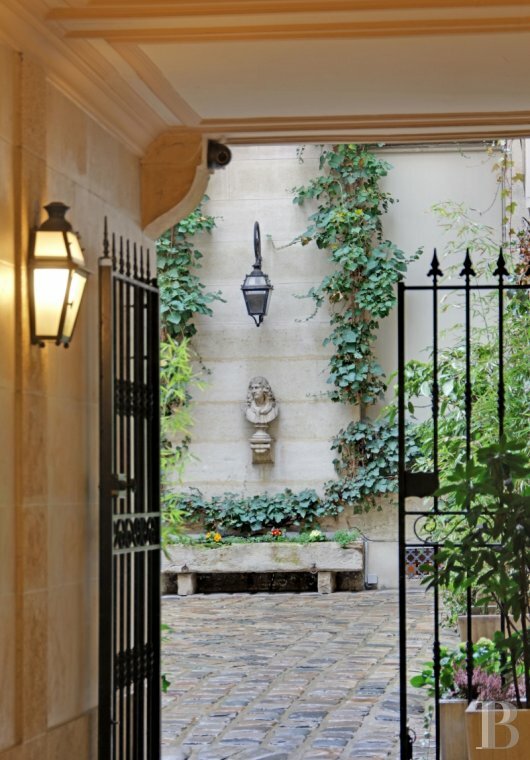 There is a touch of Parisian magic in the air with the proximity of food shops, markets and superb boutiques such as those under the Palais-Royal arcades. 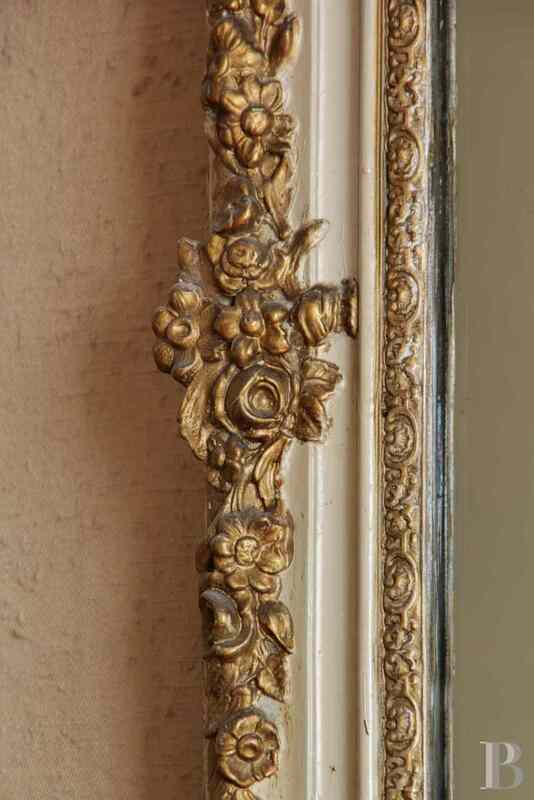 No doubt the necessary restoration works will be carried out with a light heart in such cultural and human surroundings.